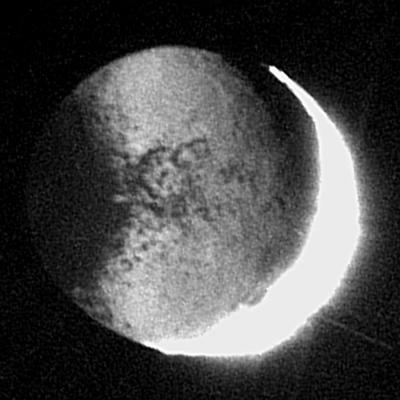 New details on Iapetus are illuminated by reflected light from Saturn in this revealing Cassini image. 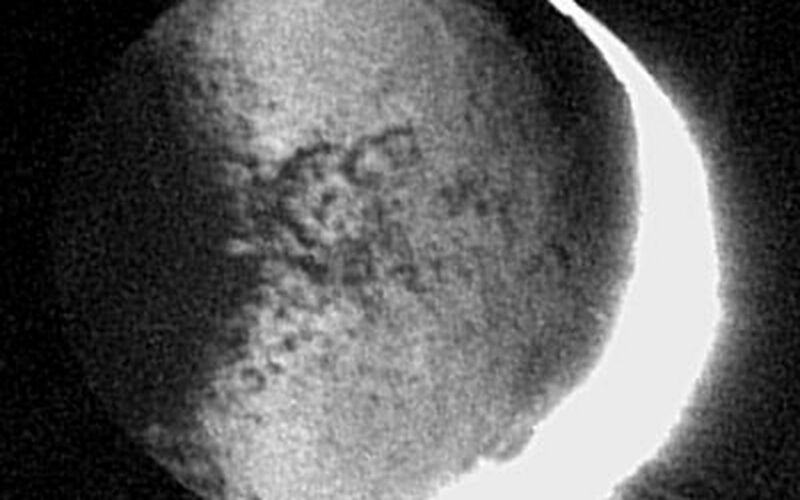 Never-before-seen features on the Saturn-facing part of Iapetus' bright trailing hemisphere are visible for the first time, including many dark spots, and a sharper view of a dark, circular structure that was first seen at very low resolution by NASA's Voyager 1 in 1980. Iapetus diameter is 1,436 kilometers (892 miles). The image shows mainly the night side of Iapetus; part of the far brighter sunlit side appears at the right and is overexposed due to the long integration time of 180 seconds. Despite this long exposure time, almost no blurring due to the spacecraft's motion is apparent. 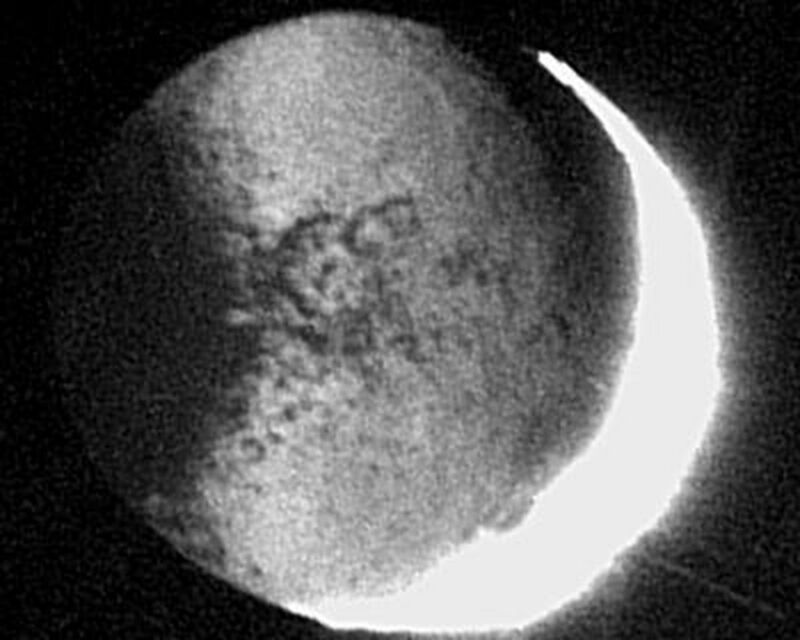 This technique for imaging the night side of Iapetus will be used again during a flyby on Jan. 1, 2005, when Cassini will pass 13 times closer to the icy moon. 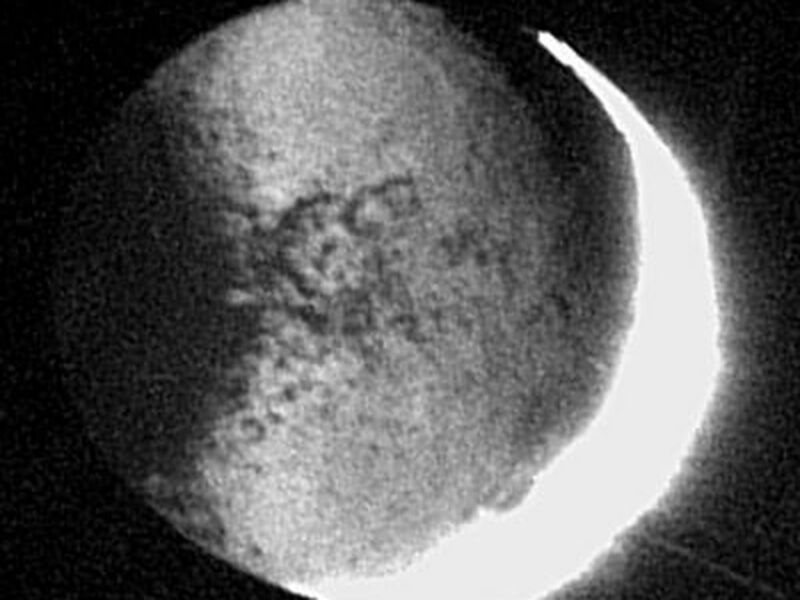 The image was taken in visible light with the Cassini spacecraft narrow angle camera on Oct. 22, 2004, at a distance of 1.6 million kilometers (994,000 miles) from Iapetus, and from a Sun-Iapetus-spacecraft, or phase, angle of 161 degrees. The view is centered on 0.4 degrees north latitude, 317 degrees west longitude on Iapetus. The image scale is 9.4 kilometers (5.8 miles) per pixel.